With the release of vSphere 6.5 VMware has introduced a new method for creating a backup of the vCenter Appliance. This method is available from the vCenter Appliance web management interface on port 5480 (https://applianceaddress:5480). 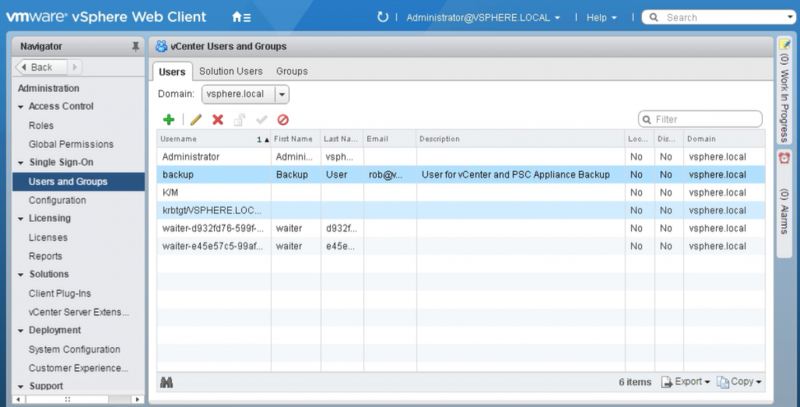 Tip: Starting with vSphere 6.7 scheduling functionality has been added as a native feature in the appliance, eliminating the need for this workflow. It still applies to vSphere 6.5. Unfortunately the user interface does not allow you to schedule the backup. And I don't see administrators create daily manual backups of their vCenter appliances. So therefor I have spent some time to build a workflow for vRealize Orchestrator that allows you to schedule the backup of a vCenter appliance. The workflow uses the Rest API Plugin and the VMware vCenter Server Appliance Management API to create a backup for one or more vCenter 6.5 appliances (which could also be a Platform Services Controller). Backup files are stored via FTP, which could also be FTPS, SCP, HTTP or HTTPS, as is documented in the API Documentation. I have tested the workflow with FTP and FTPS. Before using this workflow always first manually create a backup from the web interface on port 5480 on your appliance. By doing this you can verify the protocol being used and the correct settings for paths and credentials. When this is successful you can use those parameters as attributes in the workflow. With this workflow (see image below) you can schedule the backup from vRealize Orchestrator. 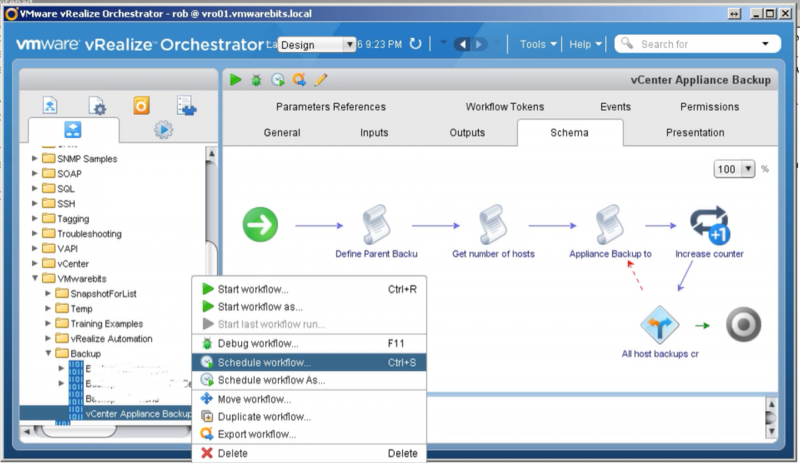 If you have never worked with vRealize Orchestrator the this article is be a good source to get you started: Create your first Orchestrator Workflow. If you do not have vRealize Orchestrator in your environment I suggest to download and deploy the appliance version (documentation). After importing the workflow you must configure some of the attributes of the workflow. One of these attributes is a user that can be used to access the backup feature via the API. You could use the administrator@vsphere.local account but it's better to create a specific user for this process, in my example I have created a local user named backup in the vsphere.local domain. 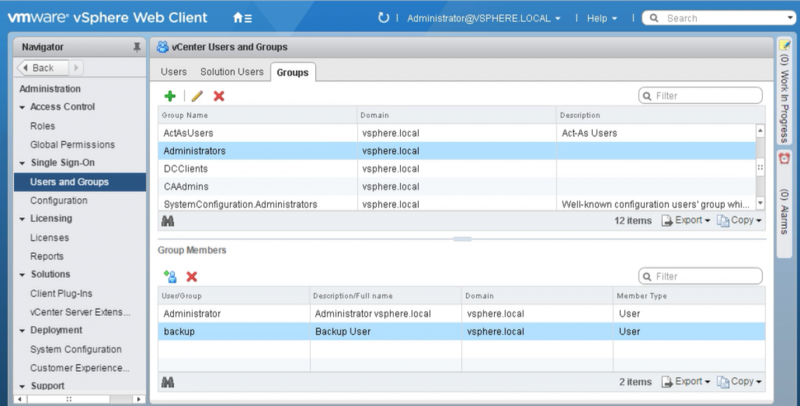 You can do this under the Administration menu in the vSphere Web Client under the Single Sign-On option. This can only be configured if you are already logged in as an SSO administrative user such as administrator@vsphere.local. Next assign this user to the administrators group. This is also where you could configure a user from one of the configured identity sources such as active directory to run the backups with. 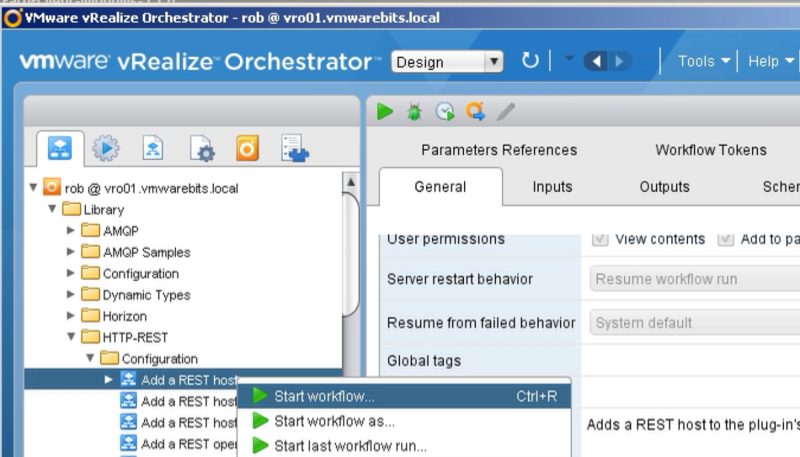 In vRealize Orchestrator the first step is to create one or more Rest Host objects. 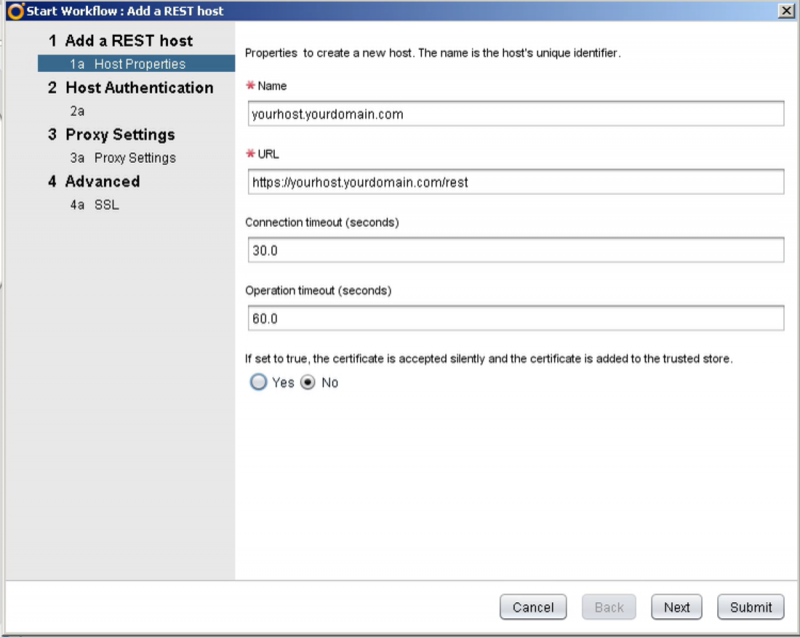 You can find this option under the library folder of the HTTP-REST plugin under the configuration folder: Add a REST host. In the next steps provide the credentials for the user that you can use for executing the backup jobs. For other steps accept the default values and make sure to accept the host's SSL certificate when executing the workflow. Next it's time to configure the attributes for the vCenter Backup workflow. Some of the attributes are self explanatory and the description will further explain for which purpose they are used. One attribute might not be straight forward. This is the Array of Rest Hosts. It must contain at least one host object. 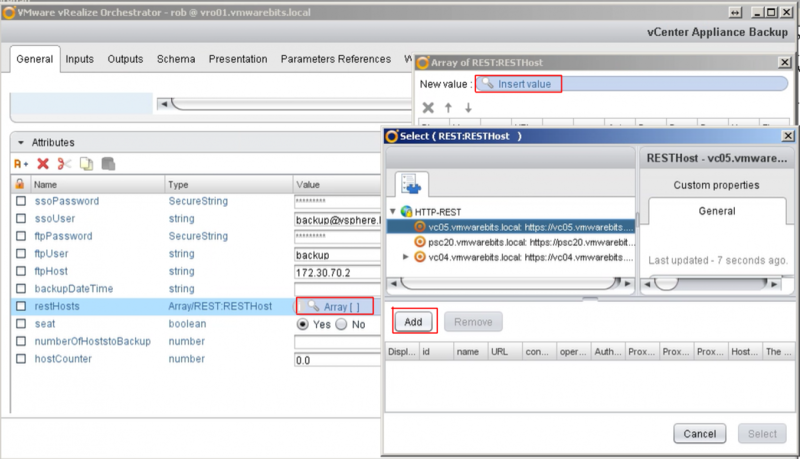 Click the attribute and follow the steps in the image below to add the previously created Rest Hosts to the array. There is one more attribute I would like to explain about here: seat. It's a boolean that allows you to configure whether or not to include the S.E.A.T. part in your backup. This is the part that contains all the data for Statistics, Events, Alarms and Tasks. ANd it is an optional component. It is also the part that will consume a possibly gigantic part of your storage, compared to the default and mandatory component (common) that will create a backup of the Inventory and Configuration. For a Platform Services Controller the workflow will always only perform a backup of this latter part because that type of appliance does not contain any SEAT-data.